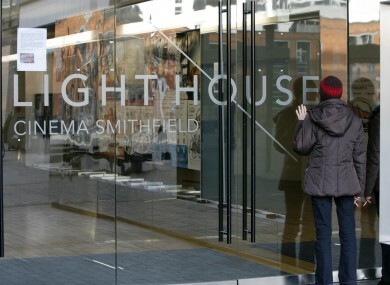 The Lighthouse cinema in Smithfield closed in April 2011. THE ANNUAL JDIFF (Jameson Dublin International Film Festival) is to host some of its prestigious film screenings in the Light House cinema in Smithfield. While the final schedule for the festival will not be released until 2 February, TheJournal.ie has learned that JDIFF will use the Dublin arthouse cinema as one of its venues. This will provide a significant kickstart to the new phase in the cinema’s fortunes. It closed down in April of last year after running up a rent debt of over €100,000 but is now reopening, apparently under the new management of Element Pictures. While the movie distribution company have yet to release an official statement on its new venture, it has already posted a hiring notice for cinema staff. Twenty staff lost their jobs when the Lighthouse closed last year. The recruitment advertisement – posted at 11am this morning – is looking for “a limited number of full and part-time cinema operatives” to work in a “new city centre cinema”. Local TD Joe Costello had said last year that the cinema’s closure would turn the Smithfield area into “a ghost town” and a Facebook campaign was launched to try to save the cinema. The Smithfield Square on which it is located has few operating commercial units, although there were signs of some new life late in 2011 with the opening of the large Generator Hostel directly across from the Lighthouse on the site of the old Chief O’Neill’s Hotel. Email “Reopened Light House Cinema to be used as Dublin Film Festival venue”. Feedback on “Reopened Light House Cinema to be used as Dublin Film Festival venue”.